A new Wall Street Journal/NBC poll shows that retired neurosurgeon Ben Carson has pulled out to a six point lead, 29-23 over Donald Trump. Trump regaining that lead, ahead of Carson by 5 points. In the WSJ/NBC poll Florida Senator Marco Rubio places third with 11% and Texas Senator Ted Cruz with 10%. Jeb Bush is 5th with 8%. No other candidate polls more than 3%. Other details on the poll will be released at midnight. 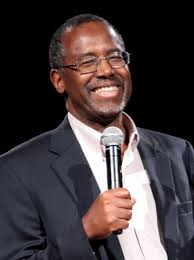 Polling by WSJ/NBC shows that support for Carson has tripled since July. While much of Carson's phenomenon appears to be Trump voters switching to the much more reserved physician, Carson's support seems to be broader than that. An NBC/WSJ poll in late July showed Carson and Trump getting a combined 29% of the vote. That rose to 41% in a poll two months later and then 47% in a subsequent NBC/WSJ poll. With the most recent poll, the combined Carson/Trump numbers stand at 51%. Meanwhile outsiders Texas Senator Ted Cruz and Carly Fiorina have increased their combined numbers, driven by Cruz's improved numbers. While Rubio is sitting in a prime position to win the nomination, the anti-establishment, outsider Republican vote appears to be holding strong. At some point, Rubio, a former Tea Party candidate who alienated many on the right by supporting comprehensive immigration reform, will have to find a way to unify the two factions of the GOP. Carson isn't tough enough to take on Hillary. The GOP needs a head basher like Trump or a throat slitter like Rubio to beat her. I doubt he will be leading anything, now that he has admitted he lied about West Point. What else has he lied about.